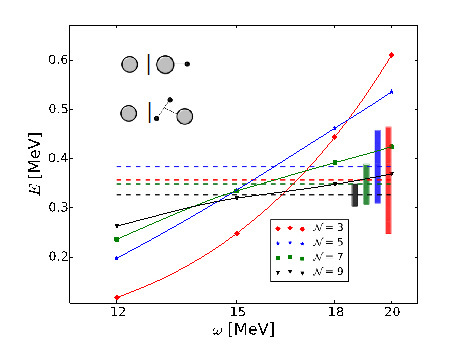 A feynman diagram of proton-neutron scattering mediated by a neutral pion. Anomalies always catch the eye. They stand out from an otherwise well-understood order. Anomalies also occur at sub-atomic scale, as nuclei collide and scatter off into each other—an approach used to explore the properties of atomic nuclei. The most basic kind of scattering is called ‘elastic scattering,’ in which interacting particles emerge in the same state after they collide. 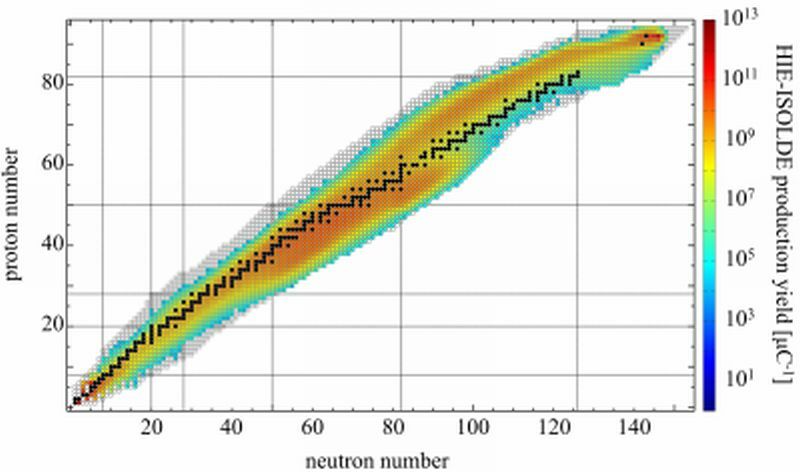 Although we have the most precise experimental data about this type of scattering, Raymond Mackintosh from the Open University, UK, contends in a paper published in EPJ A that a new approach to analysing such data harbours potential new interpretations of fundamental information about atomic nuclei. Schematic distribution of the breakup. Regardless of the scenario, breaking up is dramatic. Take for example the case of carbon (12C) splitting into three nuclei of helium. Until now, due to the poor quality of data and limited detection capabilities, physicists did not know whether the helium fragments were the object of a direct breakup in multiple fragments up front or were formed in a sequence of successive fragmentations. The question has been puzzling physicists for some time. Now, scientists from Denmark's Aarhus University have used a state-of-the-art detector capable of measuring, for the first time, the precise disintegration of the 12C into three helium nuclei. Their findings, released in a study published in EPJ A, reveal a sequence of fragmentations, relevant to developing a specific kind of fusion reactions and in astrophysics. Interaction positions determined by the pulse shape analysis of AGATA and the AGATA spectrometer at GANIL (picture by P. Lecomte). 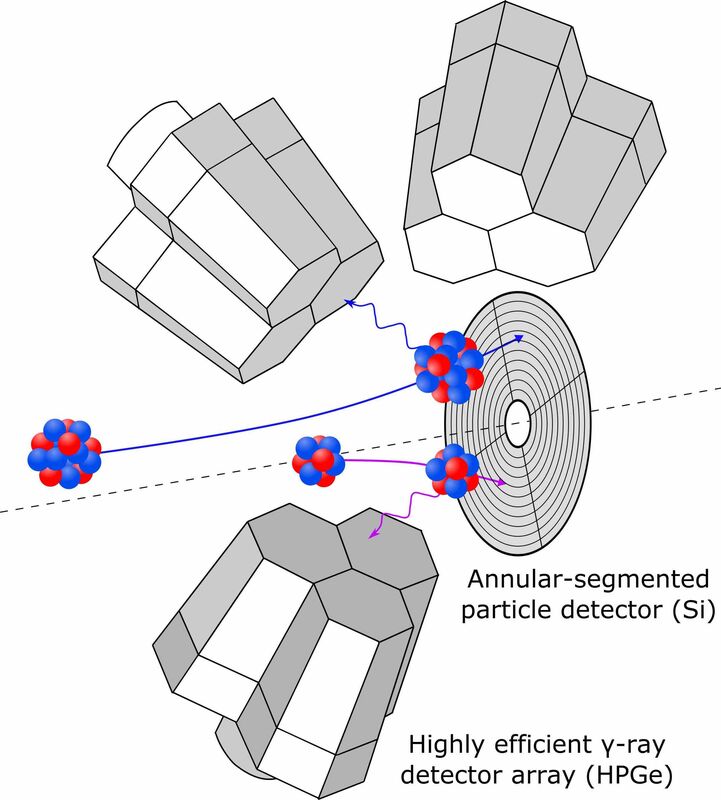 High purity germanium detectors have grown into the most popular devices within the field of gamma ray spectroscopy. The sensitive part of these detectors consist of the largest, purest and monocrystalline semi-conductors used on earth. In the past Ge, detectors were famous for their outstanding energy resolution and timing information for electromagnetic radiation, especially in the field of nuclear physics and nuclear astrophysics. Recently the introduction of digital data acquisition systems and the segmentation of the Ge crystals opened up new opportunities. The interaction position of the gamma rays inside the detector volume provides new additional information by means of the pulse shape of the various signals. In this way, the Ge detector becomes a position sensitive device and allows for a novel detection method called gamma-ray tracking. Extraction of the excitation energy of the ½- state of lithium ( 7Li ) using the dependence on the harmonic oscillator frequency ω. The atomic nucleus is highly complex. This complexity partly stems from the nuclear interactions in atomic nuclei, which induce strong correlations between the elementary particles, or nucleons, that constitute the heart of the atom. The trouble is that understanding this complexity often requires a tremendous amount of computational power. 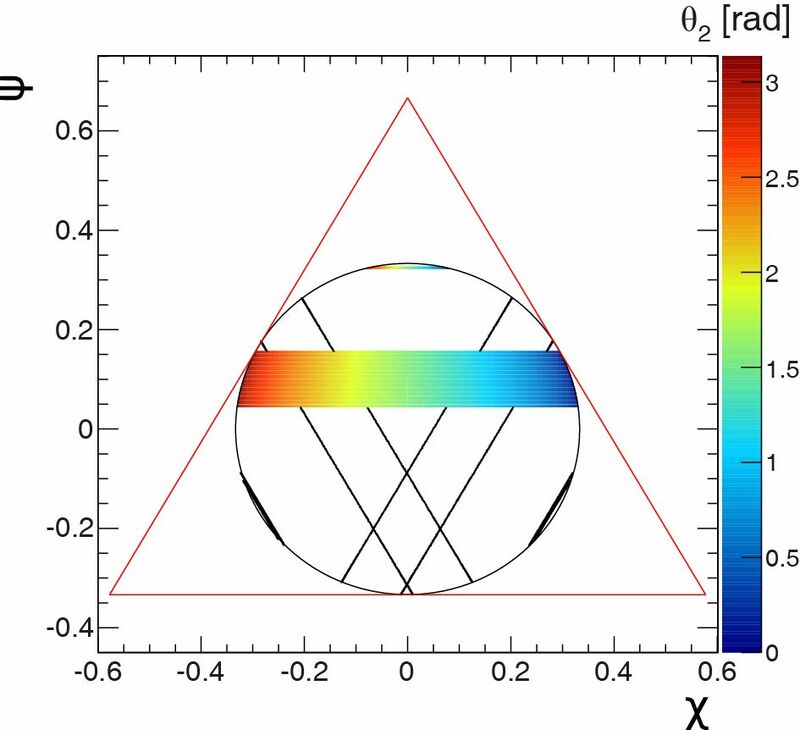 In a new study published in EPJ A, Susanna Liebig from Forschungszentrum Jülich, Germany, and colleagues propose a new approach to nuclear structure calculations. The results are freely available to the nuclear physicists’ community so that other groups can perform their own nuclear structure calculations, even if they have only limited computational resources. The Nuclear Physics Division of the EPS awards the prestigious Lise Meitner Prize every alternate year to one or several individuals for outstanding work in the fields of experimental, theoretical or applied nuclear science. 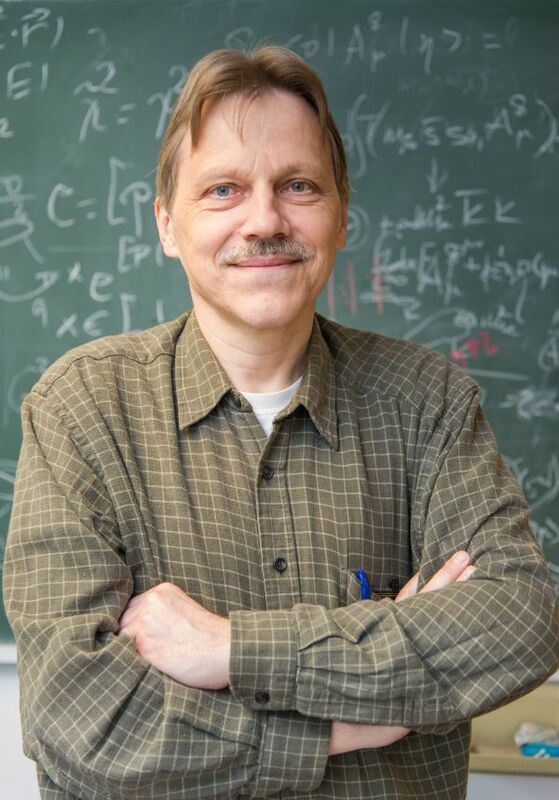 Professor Ulf-G.Meißner, Universität Bonn and Forschungszentrum Jülich, Germany, Managing Editor for Reviews and former Editor-in-Chief of EPJ A, receives the 2016 Lise Meitner Prize “for his developments and applications of effective field theories in hadron and nuclear physics, that allowed for systematic and precise investigations of the structure and dynamics of nucleons and nuclei based on Quantum Chromodynamics”. Nuclear physics’ interpretations could benefit from approaches found in other fields of physics. 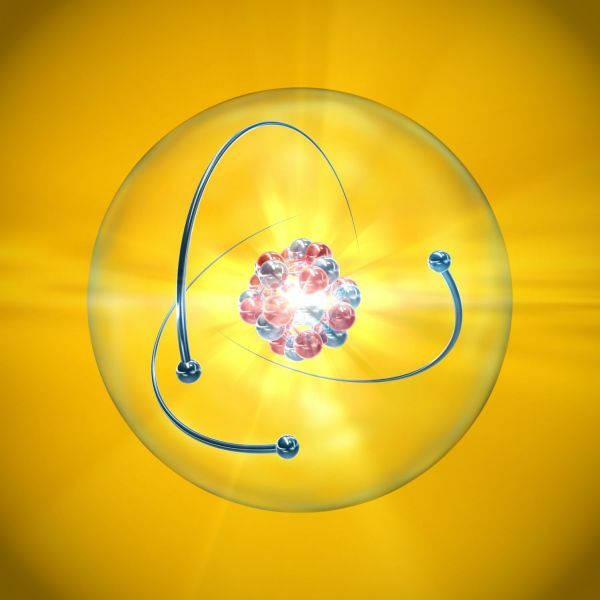 The theoretical view of the structure of the atom nucleus is not carved in stone. Particularly, nuclear physics research could benefit from approaches found in other fields of physics. Reflections on these aspects were just released in a new type of rapid publications in the new Letters section of EPJ A, which provides a forum for the concise expression of more personal opinions on important scientific matters in the field. In a Letter to the EPJ A Editor, Pier Francesco Bortignon and Ricardo A. Broglia from the University of Milan, Italy, use, among others, the example of superconductivity to explain how nuclear physics can extend physical concepts originally developed in solid state physics. Dedicated detection arrays for particle--ray coincidences are now routinely in use at radioactive-ion beam facilities around the world. This paper presents a number of novel and alternative analysis techniques to extract transition strengths and quadrupole moments from Coulomb excitation data with Radioactive Ion Beams (RIBs) using the GOSIA code. It is anticipated that related approaches and techniques will gain an even greater importance as a wider range of post-accelerated RIBs becomes available at the next generation of ISOL facilities.